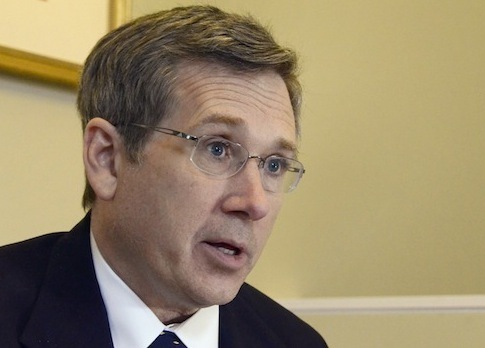 Sen. Mark Kirk (R., Ill.) said Thursday he would not vote for his party’s presidential nominee Donald Trump in November because he is "too bigoted and racist" for his state. When asked whether he believed Trump or Democratic presumptive nominee Hillary Clinton would serve as a better commander in chief for the nation, Kirk said neither was fit for the job. "I do not support Hillary Clinton and I told the public that I did not support Donald Trump, either. I think he’s too bigoted and racist for the Land of Lincoln," he said during an interview with "Big" John Howell on Chicago’s WLS-AM 890. The audio was posted online by Buzzfeed. Kirk said instead he planned to write in former CIA Director David Petraeus. "I think if he announced, he would just light up the political spectrum," he said. Kirk announced last week that he would not vote for Trump following the business mogul’s accusations that a Mexican-American judge presiding over a lawsuit on the now-defunct Trump University can’t be impartial because of his heritage. "As the presidential campaign progressed, I was hoping the rhetoric would tone down and reflect a campaign that was inclusive, thoughtful and principled," Kirk said in a statement then. "While I oppose the Democratic nominee, Donald Trump’s latest statements, in context with past attacks on Hispanics, women and the disabled like me, make it certain that I cannot and will not support my party’s nominee for President regardless of the political impact on my candidacy or the Republican Party." Kirk is currently one of the most vulnerable Republican incumbents in the senate facing reelection this November. This entry was posted in Politics and tagged 2016 Election, Donald Trump, Mark Kirk, Republican Party. Bookmark the permalink.